At our Friday night dinners, we enjoy having guests. I am very busy during the week, and I rarely have time to engage people in conversation other than to give a quick hello and how are you. The Sabbath, however, is a day that moves slower than the rest. I disengage from my mundane activities and can think about life, about relationships, about getting to know people better. On one recent Friday night when we invited a number of people I did not know well, I learned that one of our guests seriously considered becoming an actress. But she realized early on that such a career would be challenging for one who wanted to observe the Sabbath. Being an actress would raise other lifestyle issues as well. So many in the entertainment industry lead lives outside of conventional morality and the whole scene would be problematic for a person of serious religious faith. Therefore, she decided to stay away from a career in which her values might be compromised. 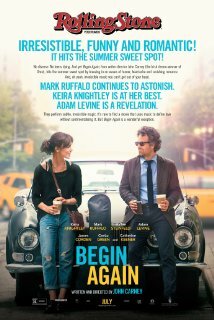 I thought of this as I watched Begin Again, the entertaining story of Gretta, a young singer/songwriter, who has a chance at stardom, but who, through the crucible of life experience, ultimately foresees the pitfalls of fame. The story opens as Dan, a music producer who has fallen on hard times, discovers Gretta in a Greenwich Village bar singing one of her iconic songs. Dan is taken by her music and offers to sign her with his former record label. Though at first reluctant to work with him, Gretta decides to give it shot and see what happens. At first, nothing does happen, but then Dan gets the idea of recording Gretta’s album on the streets of New York. Dan, recruiting a number of talented musicians who are between jobs, is able to produce an album that might possibly be a huge success. The entire experience of working together to produce the album bonds Dan with Gretta artistically and emotionally. Gretta takes an interest in Dan’s personal life, encouraging him to reconstruct his own life, which is in shambles. Divorced from his wife and disrespected by his teenage daughter, Violet, Dan is emotionally fragile and his friendship with Gretta gives him a new sense of purpose in life. Gretta’s recent breakup with her unfaithful boyfriend Dave, also a singer/songwriter, has left her emotionally scarred. Gretta appreciates the honesty of Dan, who shares her love for music that is authentic and not crafted just to be commercial. To her and Dan, making music is not just about making money; it also about stirring the soul. In contrast, Dave is animated by the business of music. He puts great stock in the opinion of others and is quick to leave his principles behind. Gretta comes to understand this when she sees Dave performing before a packed house of female admirers who Gretta knows will satisfy Dave’s desire for fame and adulation. Gretta wisely decides to assert her autonomy and chart her own course to success. For Gretta, music is her muse. Success means being able to share your creativity with the world. She will not compromise her principles, and so she allies herself with Dan who makes no demands on her and understands her need to preserve her artistic independence. The Talmud instructs man to stay far away from a bad neighbor, someone who potentially can influence you to do bad things. The advice relates to choice of friends both on a personal level and in the marketplace. Gretta in Begin Again chooses to stay away from negative influences, from those people who value compromise over personal integrity. Posted in Comedy, Drama, Movie review, Musicals, Romance. Bookmark the permalink. Corny, but at least the songs were good. Nice review.